Since 1978, ESC coaches have been volunteer parents. Prior playing experience is helpful, but not necessary. ESC provides training for coaches throughout the year. The Center of Excellence and the Soccer Center are skill-training programs for coaches and teams. We also host Youth Module coaching courses each season. ESC strongly recommends that each coach take advantage of the coaching programs to the benefit of their teams. We would like to thank all of our coaches for vounteering to coach again for this upcoming season. Your help is much appreciated. To make things run smoothly we have added some helpful information below to keep everyone up to speed. Please notify your Age-Group Coordinator if you would like to coach your player's team. Coaches, assistant coaches, team managers, and student coaches, (anyone over 18yrs old who will interact with the players) are REQUIRED to complete a background check with OSA (Oklahoma Soccer Association) prior to being assigned to a team. Your Age Group Coordinator will generate your coach or assistant coaches account through your players registration. Got Soccer will generate an email for you to complete the Risk Management Report which will be completed by OSA. A secure username and password protects your information and this Risk Management report is confidential. At the coaches meeting, coaches will meet their coordinators who will have their rosters and answer any questions. U4 and U5 coaches will receive their player's T-Shirts and post season medals. Coaches "Must" contact all of their players by the weekend of the coaches meeting. Also, schedule a team practices and a parent meeting. Select player numbers for your players. Uniforms and 'Team Order Forms' are available at Soccer USA. TEAM UNIFORM ORDERS MUST BE PLACED AT SOCCER USA ASAP AFTER THE COACHES MEETING. Coaches please instruct players and parents to pick up their soccer gear at Soccer USA at 1279 W. Danforth in Edmond. Be sure to download the uniform package flyer at the bottom of this page. 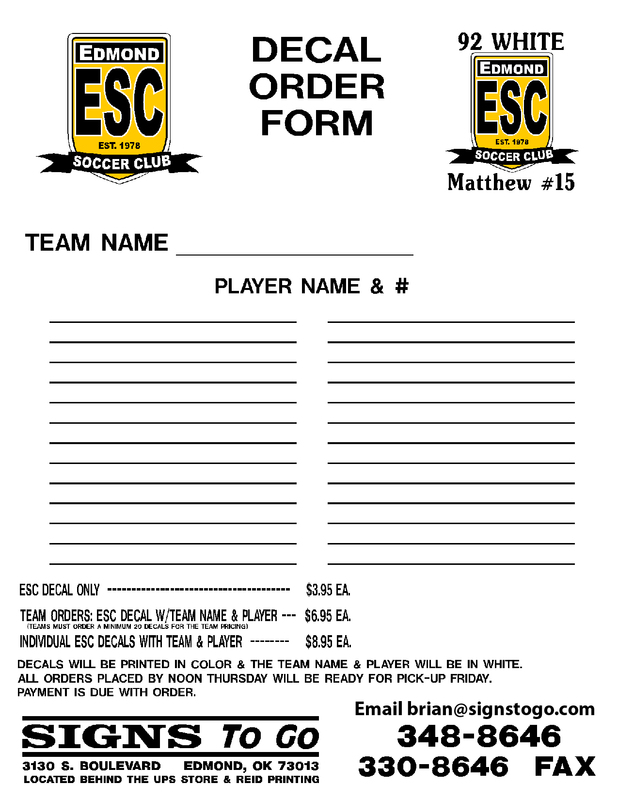 If this is your first time coaching for ESC, you can include your request to coach in your player's online registration form, write it on the paper registration form, or send a note to the coordinator to your player's age group coordinator. Recreational coaches are almost entirely parent volunteers. Practices are held at the coaches home, or at a field or neighborhood park. Several teams practice at local school lots, churches, or on open spaces that are convenient to team members. Please check the 'Documents' page for a map of public parks in Edmond. Our website is designed to answer all questions that coaches may have. It also provides schedules, fields, documents, staff contacts, as well as league and tournament information. Let us know if there is any way that we can assist you. The coaching pages include the Recreational and Traveling Rec tabs at the top.There are also Resources and Documents pages. The Frequently Asked Questions page was designed to answer many of the questions coaches have throughout the year. Be sure to instruct your parents on how to utilize the website to get connected. The age group coordinators are here to organize the teams and manage your communication throughout the season. Our Recreational Chair and our Technical Director are also here for you to handle coaching issues. All of these staff members can be reached via email on the 'Coordinators/Board' page of our website. GotSoccer: Player accounts and coach accounts are reached by logging in to www.gotsoccer.com. Security: GotSoccer operates with the use of unique secure passwords, restricted access, and encrypted data entry. ALL players are required to have shin guards, cleats, age appropriate ball size, black shorts and black socks. These can be purchased at Soccer USA. U4-U5 players are provided a T-Shirt by ESC. The t-shirts are delivered at the Coaches Meeting and will be distributed by the players Coach at the parent meeting prior to the season. U6-U10 players must purchase the Official approved ESC Nike Club Uniform The official approved ESC Uniform consists of a Black/White Nike Integris Jersey set, Black shorts and team socks. (Each player must wear the same team socks.) Uniforms are available at Soccer USA. The official approved ESC Uniform consists of a Black/White Nike Integris Jersey set, Black shorts and team socks. (Each player must wear the same team socks.) Uniforms are available at Soccer USA. All ESC uniforms must be ordered at Soccer USA on Danforth in Edmond. Youth and Adult sizes are available to try-on for sizing. Soccer USA will iron on the numbers to the jersey. PLEASE wait until after your parent meeting before having the number ironed on the jersey. Parents will be contacted when the order is completed. U4-U5 Teams are provided a t-shirt by the club. Coaches will receive these at the Coaches Meeting and distribute to the parents at the parents meeting. Coaches: Once you have been cleared by Risk Management to coach, you will be given a Coach Account AND a Team Account. Check with your coordinator for login information.Your Team Account allows you to communicate with your players with the ease of group emails. It is the coach's responsibility to see that players are registered during the Registration period. (prior to the Late Registration period. Emails and phone calls are necessary to assure that your players have all registered before they can be placed on your team. Traveling Rec teams should update player information and photographs for Player Passes as soon as possible. You may use GotSoccer to view your schedule, print your rosters, and confirm any game changes. Your coordinator may post scores and League Standings in the Divisions U10 and up. As you near the end of your season, check with your coordinator to learn of your teams claim on Day of Champions bids. You should also take note of players who are returning for the following season to prepare them to register EARLY to avoid late charges and to guarantee their spot on the team. The Edmond Soccer Club offers various opportunities for coaches to attend workshops, training sessions, etc. to help with running effective training sessions with their team. These opportunities are typically free of charge, so be sure to take advantage of these events. F License Course: Online anytime. Click here to take the course. Center of Excellence: Monday Nights - Observe ESC Staff Coaches . Curriculum: The Technical Director will provide season long curriculum. ESC coaches and players are fortunate to have Technical Director of Recreation Instruction, Coach James Soesbee here. Informed ESC coaches regularly check in on James' YouTube Channel to find organized, easy to follow coaching lessons. There are over 25 videos covering topics such as shooting, possession, passing, and various technical ball skills techniques. Soccer goals have caused serious injury and death. ESC maintains a strict policy regarding goal safety. Portable goals should be used whenever they are available. Coaches should invest in small portable goals to use at the ESC fields. Movable soccer goals should only be moved by authorized and trained personnel. For the safety of our members, DO NOT MOVE THE PERMANANT GOALS. Do not swing or hang on goals or nets. DO NOT REMOVE GOAL ANCHORS. For all administrative questions, get with your coordinator! Get Connected.